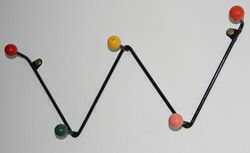 The retro style coat hook with coloured balls was common place in UK homes in the 50s and 60s. The design was originally inspired by models of atoms and molecules. It was all about science and what science could do for the new society. The design was known as Cocktail Cherry. It was also common on magazine racks. In the contemporary period of the 50s and early 60s people were hungry for modern design. The Cocktail Cherry design had a particular appeal and people bought it in huge numbers. Its popularity lasted well into the 60s. Both parents and my in-laws had these coat racks in their homes in the 60s (and my in-laws still use theirs). We have two of these coat racks in our hallway today and they look great. They are very practical, taking a huge number of coats, hats, scarves and water proofs. Of course this won't be one by Charles and Ray Eames. The Vitra Hang It All Coat Rack by Charles & Ray Eames is available from Heals and John Lewis. This is the ultimate retro coat hook with 14 large coloured balls. It looks truly fantastic: a real retro treat. Heals was a leading furniture and design store in the 50s and 60s, offering the very best of contemporary design. Today they sell some top quality retro products.